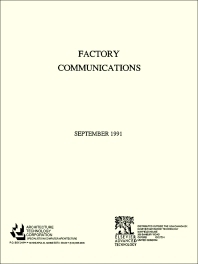 Factory communications as a subject and a technology depend on area networks, whether local (LAN) or wide (WAN). Therefore, a large portion of this report covers such networking. In addition, Factory Communications covers the range of factory automation devices, including PCs, PLCs, I/O devices, and software. Data exchange and cabling are other aspects of factory communications that are covered in this report. Introduction. Process LANs and CIM LANs. Networking. Broadband networking. Industrial LANs. Ethernet performance and EMI. Industrial control. The LAN/WAN blend. Deviced. Industrial I/O. Linking PLCs to the factory floor. Single channel I/O. Direct field to I/O. Data exchange. Planning factory data. Electronic data interchange (EDI). Interactive identification, ARCNET and Netbios. Cabling. Choosing the right fiber optics. A case History–Allegheny ludlum. Driving the process. Pushing real time. Coping with hostility. Real–time order processing. Vendor listing.